Mountains out the hotel window, a railway main line outside the front door. Roanoke, in western Virginia, is surrounded by the gentle beauty of the Blue Ridge Mountains, yet its roots are in the rumble of fast freights. Walk out of Hotel Roanoke, where I stayed last year, hang a left and you&apos;re at the entrance to a enclosed, glass-sided walkway spanning multiple tracks used by the the Norfolk Southern. On the other side is a revitalized downtown. It&apos;s anchored by the Historic Roanoke City Market, which has been operating continuously since 1882, the year the Hotel Roanoke was built, the year the city was chartered. The market building has been extensively renovated, a project accounting for some of the quarter of a billion dollars in public and private money being invested in the downtown. That&apos;s a chunk of change for a city of 100,000 -- triple that if you include the metropolitan area. No doubt Roanoke&apos;s come a ways since it was called Big Lick. Mercifully it was changed to Roanoke. Derived from an Indian word, that should leave Roanokers forever in the native people&apos;s debt. Its ebullient mayor, David Bowers, says he&apos;s seen Roanoke change from "a sleepy, segregated southern city" to one Money Magazine puts in the top 25 of places to live, work and retire. Bowers cited a festival called Local Colors. When it started, 20 years ago, only four nationalities were identified in the city. Last year, organizers counted 97. -- Passenger locomotives for the Norfolk Southern&apos;s predecessor, the Norfolk & Western, used to be designed and built in Roanoke. Rail buffs will want to stroll along The Railwalk, an interactive "park" that starts at the market district, runs along the main line, and ends at the Virginia Museum of Transportation. Located in an old freight station, the museum boasts the largest collection of diesel and steam locomotives in the U.S.
-- O. Winston Link, a self-taught photographer with a passion for railways and trains, documented their demise in stunning black and white shots, taken when the Norfolk & Western was the only American railway still using steam locomotives. The photos are in a museum named for Link, located in the visitor centre. -- The Taubman Museum of Art houses mainly contemporary American art. -- Youngsters will love Mill Mountain Park Zoo, where prairie dogs pose for photos. Among the critters I had never encountered before were tabby-size Pallas cats from central Asia, red pandas, and a fishing cat from southern Asia with webbed front feet. Fittingly, there&apos;s also a 16-gauge miniature train families can ride. 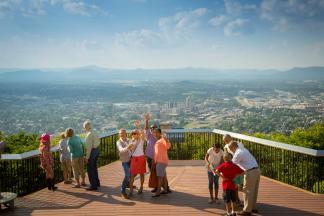 -- The Roanoke Star, sitting more than 30 metres atop Mill Mountain Park, is the world&apos;s largest. Erected as a symbol of the progressive spirit of Roanoke, "star city of the south," it&apos;s illuminated at night. Roanoke is on Interstate 81 near the Blue Ridge Parkway. Toronto is roughly 13 hours away by road. For tourist information, contact the Roanoke Valley Convention & Visitors Bureau at 1-800-635-5535 or visitroanokeva.com. Locals flock to the Roanoker, established in 1941, particularly for breakfast. Their hot biscuits were mentioned on NBC&apos;s The Today Show the morning we ate there. This being the South, gravy on your biscuits is almost obligatory. I chanced a spoonful of the Roanoker&apos;s, which has chunks of sausage. Spoon bread and peanut soup are two of the Hotel Roanoke&apos;s nods to Virginia cuisine. Restaurants locals recommended: Blue 5, Isaacs, and Cafe Asia. Details are available on Google. Roanoke Rail House, a local brewery, makes an amber ale rivalling big-name brands in taste.